House Majority Whip spoke at a 2002 white supremacist conference. 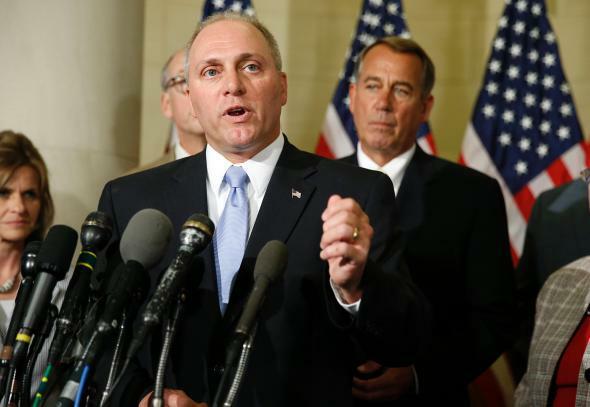 House Majority Whip Steve Scalise at a press conference in June 2014. The ghost of Rep. Steve Scalise’s (R-La.) political past made a surprise visit to the congressman’s political present on Monday, after reports began to swirl that the now–House Majority Whip once spoke at a conference hosted by a white supremacist group. On Monday afternoon, Scalise’s office confirmed to the Washington Post that the 48-year-old did speak at a white nationalist conference in 2002, while serving in the Louisiana statehouse, confirming the reporting by blogger Lamar White, Jr. on a local Louisiana politics blog. The conference was hosted by the European-American Unity and Rights Organization (EURO), founded by former Ku Klux Klan leader David Duke. A series of comments on a white supremacist site also reference Scalise’s attendance. “According to one user who attended the conference, Scalise—then a state representative—spoke to the organization at a workshop ‘to teach the most effective and up-to-date methods of civil rights and heritage related activism,’ ” Huffington Post reports. “The conference was also listed on an Anti-Defamation League list of extremist events for that year.” The Southern Poverty Law Center has also classified EURO as a hate group. Scalise’s office says the appearance was the result of under-staffing and poor vetting, and did not constitute an endorsement of the white supremacist group.